We are quite far into gaming’s story as an entertainment medium now. To drag the film industry in by the scruff of its neck by way of a comparison, we are in the equivalent of the big studio era of Hollywood, with over four decades of tradition now propping up every new venture. There are two notable discrepancies in that comparison, mind you: unlike Betty Grable, Troy Baker hasn’t had his legs insured for $1 million (to my knowledge), and unlike the vintage silver screen weepies from the Hollywood studio era, games still can’t do endings. Had enough of endings? Want a fresh beginning? Look forward to the best upcoming PC games. Perhaps it is a hangover from the arcade days, when people simply were not expected to finish games, and the sense of achievement for having done so was enough to satisfy. Maybe it is the jarring feeling of watching a story pan out without agency. Somehow, we just do not seem to have found that tradition of wrapping up interactive stories in consistently thrilling ways yet. But there are exceptions. Let’s celebrate those exceptions, unshackled from the heavy constraints of spoilers, and weigh them up against each other using the relative effort of actually reaching the ending as a yardstick. I have picked ten of them, because who are we really kidding when we make lists of nine things? And just so we are doubly clear, here: There Will Be Spoilers. It turns out you were the monster all along. The princess was running from you, you daft apeth, not waiting for you to save her. Those traps you spent the past few hours swerving using your temporal remixing powers? Yep, set by her. Take a minute to run through a little Fight Club-esque montage of foreshadowing moments in your head, if you like. Braid was not the first twist ending in PC gaming, but it felt like a first because it managed to sneak such an impactful conclusion into an indie title – when ‘indie’ meant something quite specific, and new – which appeared to emphasise mechanics over narrative for much of its duration. Verdict:Five hours of admittedly complex puzzles for a big narrative payoff. Just about worth it. The immortal Joker turned out not to be. When you watch this ending back, with years of distance to dull your emotions, it doesn’t play out like anything special. It is a bit clumsy, even: Batman’s holding the Joker’s cure in his hand, ready to give it to him, but drops it when The Lord of the Bants himself goes and stabs Bats in the shoulder for literally no reason. Thus ends Joker’s life. Except, hang on, he licks it up off the floor and that apparently does nothing? I know lapping life-saving medicine up off the floor of an old cinema is not the most sanitary way to do it, but I would have imagined that ingesting the cure at all was the important thing. And why does he give up so quickly? There is still absolutely loads of it on the floor. Your life literally depends on it, mate. Lap it up. In truth, it was simply the fact that such a big part of the franchise was allowed to die. That’s what put Arkham City’s ending up on a pedestal, and there is no point being all aloof about its workmanlike execution now because the fact is that it did have the intended impact. And it was a brave thing to do, when you consider how carefully franchises usually treat their recognisable assets, stockpiling them for future outings. So it was certainly worth playing through to witness at the time, if not today. Verdict: Arkham City’s a long game, and its payoff was worth the journey for the shock factor, rather than the artistry. This is how you do an ending. KOTOR does not need a plot twist like the above games in order to conclude its story with clout, because it already threw in a doozie during act two: you are Darth Revan. Yes, the amnesiac master of the Sith Lord you have been hunting down all this time. Malak was once your apprentice – fancy that. It was very skilful of BioWare to deploy that wee twist midway through the game, because it potentially changed your entire outlook. It is tempting to give in to a sense of destiny when you have been told you were once the most formidable Sith Lord in the galaxy, after all. It is enough to turn a light side point-hoarder in the other direction. Conversely, maybe you were playing as an evil so-and-so until that point, and decided to fight against your destiny thereon by being lovely. So when it comes to the endings, plural, of KOTOR, it is less about the nitty-gritty of killing Malak and more about giving into, or resisting, the temptation to turn to the dark side right at the last second. It is not a twist ending, but rather a final binary decision that allows you to create a giant plot twist of your own accord, and it is wonderful to have that choice. Do you dismantle Malak’s technology to create an infinite war fleet, or harness it for yourself? Either way, you were forced to ask a lot of questions deep within yourself. The developers further prove that they know what are doing, too: the light side ending is shorter and distinctly more uneventful than the dark side ending. Verdict: An enormous RPG whose second act plot twist would be enough to conclude most games, finished off with a devilishly clever final decision, and two very different cutscenes thereafter. The most ‘worth it’ a 50-hour RPG’s ending can possibly be. Remember in 2013 when we would all hop on our fixies and cycle down to the artisanal coffee shop to discuss how Jurgen Klopp’s Dortmund were actually the best team in Europe, and how we didn’t think BioShock Infinite’s ending was all that good after all? The fun we had, drinking washed Kenyan filter coffees out of plant pots in our New Balance trainers, wearing our triangle pendants and forgetting whether we were listening to Drake ironically or non-ironically. But we put those irritating affectations behind us, didn’t we? And now we all appreciate that, actually, Ken Levine and his team did something wonderful with BioShock Infinite. It was more than a racist hot air balloon ride: it was a meditation on free will versus destiny, with a bit of commentary about game design itself sprinkled on top. To put it more bluntly: Booker is Father Comstock, and the game title is very literal. It would take pages and pages of text to fully explain that final 25 minutes of gaping-mouthed revelation at the end of BioShock Infinite, but suffice to say you discover you are operating within a multiverse, and Elizabeth is an omniscient being who has helping you break a horrible cycle. It rattles your perception of who you are, who your chief antagonist is, why you were really sent on your mission, what your role is as the player in linear shooters, and how the BioShock universe fits together. Thought Infinite existed separately to the first two games? Wrong. And it did all this despite heavily foreshadowing everything about its closing twist for the entire game. The mysterious telegram telling you not to choose number 77, all those baffling exchanges between the Lutece twins, and countless other tip-offs. They all make sense once you see Infinite through to its conclusion. Verdict: It is all building up to the ending, right from the second you click ‘New Game’. The payoff’s only about 12 hours down the road, too. There was a time when calypso music meant something more than ‘there’s a gentle detective show or comedy about to start on BBC1’. In 1990, it was the beating heart of a piratical adventure that culminated in lovably hapless hero Guybrush Threepwood massacring zombie pirates with a seltzer bottle, bursts into a church, and stops a wedding between the dread pirate LeChuck and two primates in a wedding dress. This was a wonderful subversion of the already time-honoured princess-saving final act on LucasArts’ part. Elaine turns out to be more than capable of escaping capture from LeChuck of her own accord, and of hatching a plan to deceive the ghost pirate into marrying two simians standing atop one another in the belief he is betrothed to her. Guybrush’s inept attempts to rescue the damsel in distress actually only scupper those plans. Even while doling out such a sweet narrative punch, The Secret of Monkey Island isn’t too high and mighty to pause for a silly vocabulary battle with LeChuck (“I can’t believe your mobility!” “Yeah… well I can’t believe your validity”) before wrapping things up in neat, tidy, and heartwarming fashion. Verdict: This was a game of wrought iron puzzles, so it needed something pretty great to reward players for seeing it through. It had it. Some games satisfy right at the last gasp, leaving it until the final cutscene to wrap things up in a gratifying manner. Others, like Portal, use the entire third act to deliver their ending. It begins when you slip between the cracks of Aperture Science’s test facility and read worrying graffiti written by – well, who knows – tipping you off that all is not as it seems with your experiment. Some of those warning messages are imbued with a warm humour that proved resonant enough to sustain many memes for years after release. But there is also an ice-cold, creeping sensation when you first read the words: ‘The cake is a lie’. It is exhilarating, using the skills you honed over the last few hours in such tightly controlled environments to now break free of them. 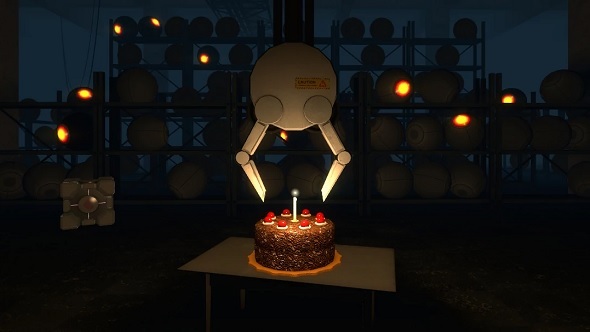 As you make your escape, dipping in and out of test chambers and exploring the inner workings of the facility that test subjects were never meant to see, you are playing Portal in a new way, at a new pace. Right at the last minute, it is still evolving. And then there is the song. As if you needed any more convincing that Portal has one of the greatest endings, hearing an autotuned vocoder crooning apologies, threats, justifications, and more threats while the credits roll is surely it. Verdict:As good as game endings get, mechanically, narratively, and musically. Right, no – don’t tell me this one. I have never actually finished it, but I feel certain it is going to be absolutely incredible. I got really far into it when I first bought it, and I have had the save games backed up since I went to university in the autumn of 2004. Because I am going to get back to it. I am. And when I do, that Jon Irenicus can get stuffed. 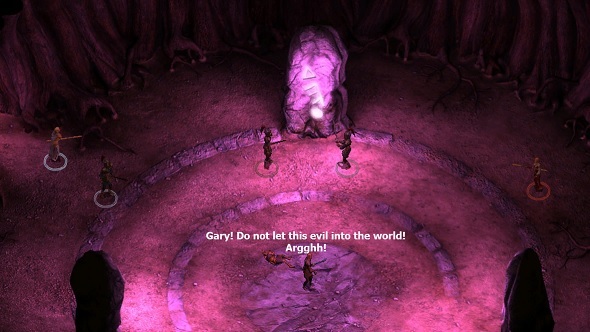 Sure, I am not quite as familiar with the lead-up to Baldur’s Gate II’s conclusion as I was 14 years ago when I first played it, but I reckon it will all come flooding back to me when that final cutscene(?) starts to play. I had a thing going on with Jaheira, I think. Wonder how that will play out. And aren’t you linked to Jon Irenicus by a soul bond or something? Anyway: awesome. Verdict: I’m positive it’ll be fantastic. The really great thing about Mass Effect 3 was how closely it bonded you with – just kidding, I was making a silly joke. I meant Mass Effect 2. Like Batman: Arkham City, this one does not shine in its execution particularly, but what is impressive is how damn much you care about these made-up computer people (and Quarians, and Turians, and Asari, ad infinitum) by the time the credits roll. For example, it takes so bloody long to ensure everyone’s survival in that final mission. Countless side-quests for each party member, none of them any more mechanically interesting than the last 70-odd hours. But still you feel that tremendous imperative to save them all, because you are captain Shepard, and that is your job. Some live-or-die scenarios are depicted with more grace than others – Jack dies because she stumbles literally inches away from the rest of the group, for example, and is immediately devoured by the swarm, who show no interest in the other fleshbags right next to her. But that’s really not the point. You really care about whoever lives or dies when you embark on that last stupid, heroic, suicide mission. It is a trick several games have shot for since, most notably Mass Effect 3, but none have achieved quite what BioWare did in 2010. Verdict:If you were able to take emotions out of it, you wouldd say it absolutely was not worth all the optional slogging about to cultivate a nicer ending. But you are not. And that is the point. Ah, no, they did. They made a beautiful game about a child’s death, and they made you cry at the ending, too. A lesson in subtlety and sensitivity, Rime’s conclusion breaks your heart with a single look between father and son. And then it is over. Just you and your thoughts now. Quick, load up a bouncy Double Fine game, stat! Verdict:Rime is not a taxing game, or a long one. When you see its conclusion you realise that, like BioShock Infinite, everything you have been doing since taking your first steps has been about this final moment. So, yes, absolutely worth it. A whole 20 years on, this is still the best conclusion to a videogame. Gordon survives the Black Mesa incident, scrabbling clear of the resonance cascade that invites invading Xen creatures into a secret New Mexico facility. He makes his way through the wrecked and abandoned underground chambers. He fights off the Vortiguants, Banshee Dogs, Headcrabs, and that enormous fish thing that the game barely even makes a big deal of but is absolutely terrifying. Then he fights off the spec ops forces sent to clear everything up. He even makes it to Xen, and kills an enormous coconut-headed baby that is somehow to blame for it all. And none of it matters a jot. The G-Man, glimpsed at frustrating distances several times throughout the game, rewrites the nature and context of your adventure in a single in-engine sequence. You thought you were an everyman surviving a random catastrophe against the odds, but instead you were a rat in a cage all along. Finally, you are offered a decision that is no decision at all: work for the G-Man’s ‘employers’ to goodness knows what ends, or decline and face certain death. For 1998, it was incredible, visionary stuff. Valve held the FPS genre in their hand and proclaimed what was possible for it. In 2018, it is still an impactful ending to PC gaming’s finest hour. Verdict: Haha, good joke. Like it’s even up for debate (I’m sure the comments will let me know in quite stark terms that it is, in fact, very much up for debate, but it will never be bettered in my mind – all the best, bye now).